These Marinated Chicken Skewers with Zucchini and Quick Salsa Verde were just made for a grill out on a hot night. Such fresh, zesty flavors everyone will be coming back for seconds. We have a beautiful big Australian BBQ in storage back in Aus. It was a wedding present from my husband’s family, and it is truly a thing of beauty. But…it’s on the other side of the world. The lovely lady that we bought our house from a couple of months back left us a dodgy little BBQ, and I am pretty sure we are going to kill it from overuse 🙂 It will die a happy death though, so it’s ok. If you need some dessert to go with your Marinated Chicken Skewers with Zucchini and Quick Salsa Verde, look no further than my Peach and Vanilla Cream Ice Cream. It is delicious. What is your favourite thing to put on the grill? 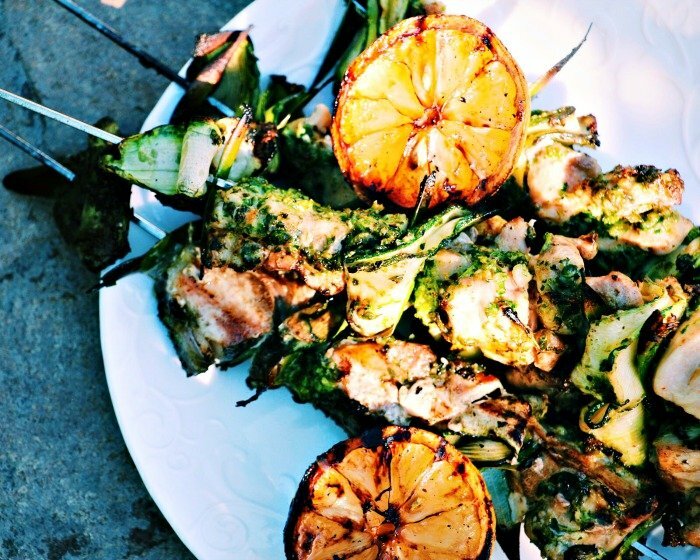 If you try out the Marinated Chicken Skewers with Zucchini and Quick Salsa Verde I would love to hear what you think. Leave a comment, like on Facebook, tweet on twitter or pin to pinterest for later. Happy eating. I serve this with some fresh crusty bread and a really simple salad. We got a house with a deck for the first time and not having a grill is really getting to me. This looks incredibly, and that salsa verde? Yum! These look gorgeous and I do need to make them soon! These skewers are a delight! Perfect colors and seasoning. Amazing recipe! F-F-F-F-FIVE STARS! Cooking outside every night… you sound like my kinda gal 🙂 I absolutely love skewers and that salsa verde sounds incredible! I hope you have a wonderful 4th! Thanks Kathleen 🙂 We had a wonderful 4th – hope you did too!! Wow – this looks both healthy and delicious! Thanks for the recipe – I will try it the summer for sure. Thanks Jen 🙂 Hope you enjoy! This sounds great! I have a goal to grill more this summer and am definitely adding this one to the queue. Pinned! Looks so delicious and vibrant! These looks absolutely delicious– I love that you used zucchini ribbons. And the sauce looks incredible! Would make a great meal for guests. Yum!! That salsa verde… I could put it on anything!! Delicious! I agree Tracy, I have tried it with so many things lately – just so easy to whip up a big batch! Chicken skewers are my favourite. I do love the addition of salsa verde for this. This looks fantastic! I pinned it for later 🙂 We have a gas grill that is plumbed into the natural gas and cook outside almost year round (we live in New Mexico)! We’re in the process of moving to south TX though, and I’m wondering how we’ll survive without our grill and our kitchen for several weeks… I’d say grilled fish for fish tacos, and grilled flank steak with chimichurri are favorites at our house! Oh good luck with the move Tamara (and coping without the grill and kitchen)! I love grilled fish for fish tacos!! This looks amazing! I will be trying this! Thanks for sharing! Very welcome Denea :)Hope you enjoy! This looks so good and you are totally right about bbq and summertime. I will have to try this out this summer. Those look so yummy! I’ll have to share this with my mom who loves to grill! Thanks! You had me at chicken & zucchini! Those are two of my favorite foods, but I’ve never had them together before. This looks like an easy and delicious way to combine them. Thanks for sharing! This sounds so amazing and fresh! Perfect for summer! What a great summery dish! Thanks so much for sharing! Do you think I could make these in the oven? Good luck!! I would love to know how they turned out! Yum this looks incredible. I bet my husband would LOVE this he loves this kind of thing! Thanks Jeanine 🙂 My hubby loves anything on the bbq as well! We grill a lot of chicken and fish. This looks delicious. Thanks for sharing. Looks like a perfect kabob for the 4th! Oh.my.gosh. This looks amazing. Saving, pinning., stumbling…do not want to lose this deliciousness! These just look quite amazing! Sharing them on social media because…yum! If only I could jump in these pictures! this looks amazing! This looks really good. We’ve been trying to eat a lot of chicken with fresh veggies. This would be a great recipe to try. Could you add squash and/or tomatoes? Yum! How do you think it would taste with some onion on the skewer, also? Amazing! I usually put onion on my skewers, but with this one I didn’t, solely because there is so much garlic in the salsa verde 🙂 But I have no doubt it would taste great! Oh my goodness, my mouth is watering. These look amazing! Thanks for sharing! I have never grilled zucchini – it looks awesome! Now to find me some fresh bay leaves!! !